"You would completely misunderstand all I’m about to tell you if you didn’t first know that studying theology at Oxford represents the complete opposite of everything I ever wanted growing up." Called is the heart-breaking, humorous, and refreshingly honest account of one twenty-something's adventure of learning what it means to be called--an adventure that took him to England, C. S. Lewis's house, and back again--and why it was only in the reality of his worst nightmare that he learned what it means to be called by the living God. Through a series of personal anecdotes, illuminating conversations, and candid reflections, Called will encourage readers to realize God has entered into our story, calling out anew each day with the words, ''Follow me,'' leaving you to ask, Will I be obedient to the calling set before me? What would it be like to leave home, career, and community to pursue a calling? Would it be as incredible as you've imagined? As scary as you fear? Called is an honest account of the inevitable peaks and valleys of pursuing a calling. most of his adult life. What does it mean for a Christian to be called? Does it mean following your dreams? Using your God-given talents? Simply doing the work before you? Or something different entirely? Called attempts to reclaim the uniquely Christian understanding of calling. "Christ is most visible to the world in the person who responds to his call of 'Come, follow me.'" "If someone had told me when I was in high school that I’d one day leave a great job and move to England to study theology, I would have said they were crazy. That is, after I asked what 'theology' is." "You would completely misunderstand all I’m about to tell you if you didn’t first know that studying theology at Oxford represents the complete opposite of everything I ever wanted growing up. If someone had told me when I was in high school that I’d one day leave a great job and move to England to study theology, I would have said they were crazy. That is, after I asked what 'theology' is." . . .
"At twenty-five, I found myself saying good-bye to the kind of career I’d dreamed of as a young boy worrying about things like rent and grocery bills and whether we’d stay in this house for more than a couple years. I was, of course, still the same little boy inside, lusting after a career that promised security for my family. And having no promise of security on the other side of this move scared me. Leaving a great job to go after what I believed God was calling me to felt irresponsible. So I left my job with a cardboard bankers box in my hands and tears in my eyes, unsure of where this journey would lead us, but confident that this first step was the right one. Short of a calling that somehow came from beyond the two of us, there was no way Jen or I would have ever considered leaving behind all the comforts we enjoyed. We said good-bye to the only friends and family we had ever known, and I found myself sitting in an airport staring out at the tarmac waiting to board my flight to England. And it was there, waiting on this side of the Atlantic, that I found myself thinking, This is going to change the rest of our lives. . . . What in the world have I done? “Inspiring, witty, honest, and brave." “Called is beautiful and heart wrenching. It’s a breath of fresh air..."
“I cannot think of a memoir I have related to more than Ryan Pemberton’s Called. It’s a book I could not put down..."
"Brings to mind the work of Donald Miller, mixed with the vulnerability of my favorite stories from NPR’s 'This American Life'...A writer to watch." "With a poignant and unflinching voice, Ryan Pemberton brings a fresh perspective to the winding and often complex journey of faith. His writing brings to mind the work of Donald Miller, mixed with the vulnerability of my favorite stories from NPR’s “This American Life.” Pemberton is a thinking Christian who does not shy away from thought provoking questions about faith. He is a writer to watch and I eagerly await his next work. Quietly powerful and inspiring, Called: My Journey To C.S. Lewis's House and Back Again is a memoir that is not to be missed." "In this finely written memoir Ryan Pemberton takes us into the halls and streets and stories of magical, historic Oxford, and into the life and home of its renowned thinker-poet C. S. Lewis. As we follow Ryan on his quest to find what it means to be called, with all the excitement and doubt and second-guessing that entails, we are the ones who make the discovery that in the end, calling isn't so much about a grand task or an exciting journey, but about listening, trust and deep surrender." "Like David the young Psalmist, Ryan knows how to write and has something to say. Intelligent, personal and refreshingly honest, Ryan’s warm heart, active mind and hungry soul shine through on every page, illuminating what is often a dimly lit path towards knowing and doing God’s will. A worthy read." “I cannot think of a memoir I have related to more than Ryan Pemberton’s Called. It’s a book I could not put down, not only because I have deep fondness for Lewis and Oxford but also because I sympathize with the unpredictable rhythms of life and calling that Ryan so eloquently captures. Calling unfurls itself more often as a twisty roller coaster than a smooth, open road. "Oxford. C.S. Lewis. Living at the Kilns. An aspiring writer. A young marriage. A life of faith. These are the ingredients of what proved to be a most enjoyable memoir. 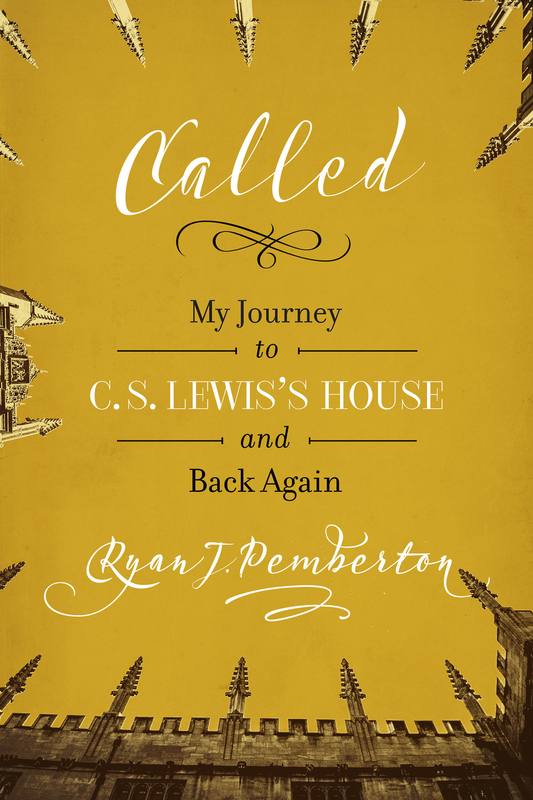 Ryan Pemberton takes you right into Oxford's stately halls, he opens up doors to occasional C. S. Lewis tidbits that even many seasoned scholars haven't seen, and he weaves a tale of faith, love, hope and life to create a delightful and entertaining journey." "I must confess that when Ryan first told me about his experience in the land of Lewis, I was more than a bit jealous. But as I started reading Called, that jealously quickly began to disappear. Ryan’s writing is so vivid and so immersive that I felt like I was right there with him in England, enjoying magical dinners at the Kilns and roaming through the hallowed halls of Oxford University. For anyone who has ever dreamed of walking in the footsteps of C. S. Lewis, but has been unable to make the voyage across the pond, this book is an absolute must read." Available from Leafwood Publishers at your local bookstore and online. Thanks so much for your interest in Called. This is my first book so, you know, it's kind of a big deal to me. If you get a chance to check it out, drop me a line. I'd love to hear what you think. If I'm ever in your area, come on out. I'd love to thank you in person. Oh, and if you want to tell others about Called, that would be the biggest compliment you could give. Thanks!